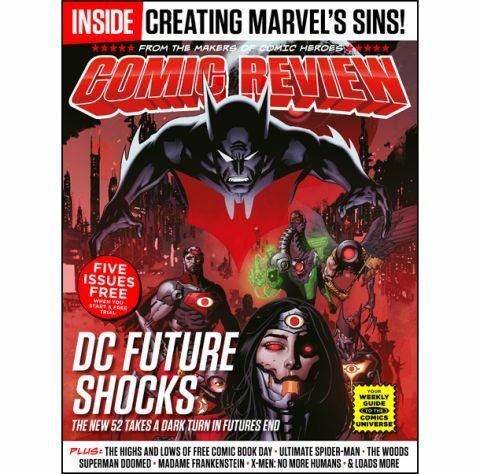 It’s BIG EVENT time of the year for the big two publishers, and Comic Review casts its eye over DC’s Futures End (which really looks like it needs a possessive apostrophe but apparently doesn’t) and Marvel’s Original Sin . We interview the Marvel boss editing Original Sin too. Plus we have a look at some of the best books Free Comic Book Day had to offer, present an all-new two-page comic strip, Al Change, and review the rest of this weeks most significant titles, including Miles Morales: Ultimate Spider-Man , Nailbiter , Hinterkind , Madame Frankenstein and Cyclops . All this for just 99p? That bargaintastic! Comic Review , available for iPad, iPhone and iPod Touch, can be found in the Comic Heroes app now and is FREE every Friday to new and existing Apple Newsstand Comic Heroes subscribers!